This document is protected by Adobe Digital Rights Management (DRM) and is not currently authorized for use with your Adobe ID. Please sign-in with the authorized Adobe ID and try again. 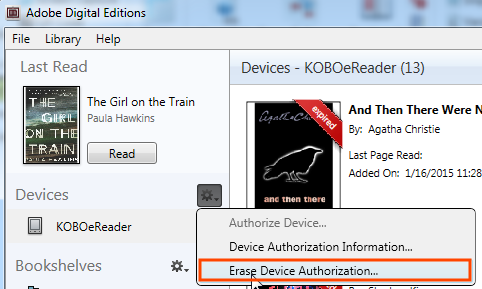 Most of the time, resetting the authorization information for your Kobo and in ADE will fix the problem. Make sure the date and time settings on your Kobo eReader are correct. You should find these in the Settings menu on your Kobo. Plug your Kobo into your computer (using the USB cable that came with your Kobo). Open ADE on your computer. 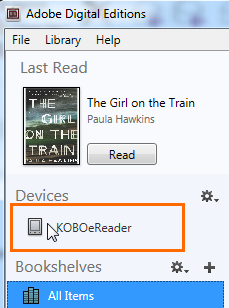 Use ADE to delete the eBook that's causing issues from your Kobo and your computer (make sure to choose the Remove from Library option). Click on your Kobo under the "Devices" menu on the left. Click next to "Devices," then select Erase Device Authorization. Click Erase Authorization, then OK to confirm. In ADE, press Ctrl + Shift + D (Command + Shift + D on a Mac) on your keyboard. In the pop-up window that opens, enter the password for your Adobe ID or OverDrive account (and make sure the correct Adobe ID or OverDrive account is listed in the drop-down menu). Then, click Continue. Select Erase Authorization, then OK. Authorize your computer again by going to Help > Authorize Computer. Note: Make sure to reauthorize your computer using the same Adobe ID or OverDrive account as before. Otherwise, you won't be able to re-download your eBook from your library's digital collection. Re-download the eBook that was causing issues from your library's digital collection. Transfer the eBook from ADE to your Kobo. This step will also reauthorize your Kobo. Try opening the title on your Kobo. If resetting your authorization didn't work, you likely need to perform a factory reset on your Kobo. Please note that when you do this, all of the information you have stored on your Kobo will be erased. After you've tried all the steps above, back up anything on your Kobo that you don't want to lose. Then, close ADE and unplug your Kobo. Factory reset your Kobo eReader. As stated above, this process will erase all of your data. When you sync next, your eBooks should automatically be restored, but please remember to back everything up before performing the reset. During your device setup, make sure you're connected to Wi-Fi. Accept any prompts to update the device. Plug your Kobo back into your computer, then open ADE. Try transferring the title again.